Physio, Massage and Machine-based Pilates – everything you need to achieve your goals. Physio, massage, machine-based Pilates, plus a range of specialist services. As a team, we identify and focus on your specific needs and goals, communicate the plan between us and keep medical records of each and every session you attend. This enables our expert team of clinicians to tailor your treatment to you. We do not believe the ‘one size fits all approach’ works for anyone. All Clinical Pilates sessions at Corefitphysio Westcott are led by clinicians with the minimum of a degree in exercise science, movement or physiotherapy. Our handpicked team are skilled in diagnosis, able to connect your symptoms to the underlying pathology and will apply excellent clinical reasoning when they select or adapt exercises for you. Whether you are injury-free with sporting and aesthetic goals or suffer from acute or long-term pain- we know we can, and will, help. In order to plan the best-fit course of treatment, all clients need to be fully assessed by a Physio. At your first visit, we will take a full history of your condition/s, review any previous investigations/reports or treatments, look at your movement, assess you using Pilates exercises and/or hands-on techniques, explain our findings and begin to treat you. We will give you a small selection of home exercises to get you going in preparation for your next session. Together you and the physio will agree on a goal-led treatment plan to target your specific needs. You will discuss which session types may be most beneficial for you. One-to-one sessions are tailored to your rehab needs by your physio or clinician and incorporate matwork, small equipment and apparatus-based Pilates. Private Pilates sessions offer the ideal route to efficiently achieve your recovery goals. Long-term injuries or ongoing conditions may best be treated in Private Pilates sessions. It is recommended that those new to pilates attend a few privates prior to joining Duo or group sessions. A course of Private sessions allows time for your Clinician to regularly revise your home exercise programme and to accurately measure your progress. Manual treatments may be incorporated into private sessions as and when needed. Private appointments are 55min and can be purchased individually or in blocks of five, ten or twenty. In a Duo there is scope to provide you with your own home exercise program which can be reviewed and progressed regularly in your sessions. As one of a pair, you will be guided by your clinician through an individually tailored exercise programme incorporating Matwork, small equipment and apparatus-based Pilates. As one of a Duo there is scope to provide you with a personally tailored home exercise program which can be reviewed and progressed regularly in your session. All new clients must attend an initial biomechanical assessment with a Physio prior to commencing Duo’s. Having assessed you individually and watched you move your Clinician will be best able to tailor your Pilates programme to your specific needs and can then safely and effectively progress you in the shared session. Manual treatments may be incorporated into duo sessions as and when needed. These 55-minute sessions are sold individually, or in blocks of five, ten or twenty. In a Semi-private session the Clinician provides each of the three participants with a bespoke exercise programme tailored to individual needs and ability. The session incorporates matwork and machine-based Pilates including Cadillac, Arc, Split-pedal chair and Reformer exercises. All new clients must attend an Initial Biomechanical assessment prior to commencing classes. 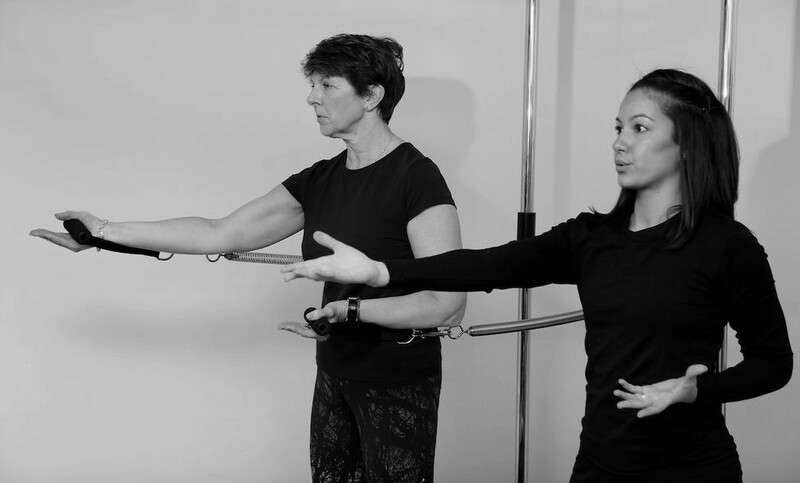 Having assessed you thoroughly and watched you move your Clinician will be best able to tailor your Pilates programme to your specific needs and through constant reassessment, your exercises are progressed safely and effectively in class. A Semi-private has a maximum of 3 participants. These 55-minute classes are sold individually, or in blocks of five, ten or twenty. Reformer classes are taught by Physios or clinical Pilates instructors. Our expert therapists are able to safely manage the different abilities, limitations and strengths of each of the class participants by adapting the exercise prescription while providing a dynamic and enjoyable workout. Reformer classes aim to improve balance, co-ordination, flexibility, mobility and posture. Regular attendance will dramatically enhance endurance, strength and tone. An Initial Biomechanical assessment with a Physio is required to ensure that you are best suited to classes, as some injuries or conditions require closer supervision and more bespoke treatment. There are a maximum of 4 clients in each class. These 55 minute classes are sold individually, in blocks of five, ten, twenty or thirty. Based on the findings from your Initial Biomechanical assessment it may be agreed that manual Physio sessions are a good treatment option for you. A Physio session may incorporate any of the following: joint mobilisation, sports injury treatment, assessment and treatment of pelvic and spinal alignment issues and/or targeted soft tissue mobilisation. We will make sure you understand the causes and nature of your injury. Your physio assesses and re-assesses your problem, talks to you about the contributing factors, and provides treatment to improve your symptoms. A combination of Pilates sessions and Manual Physio may prove the best way to treat longstanding conditions. A course of Physio sessions allows time for your Physio to regularly revise your home exercise programme and accurately measure your progress. Half-hour Physio appointments may be purchased as once offs or in blocks of three or six. Massage is a highly effective method of mobilising tight, overactive or adhered soft tissue (muscles, tendons and ligaments). Therapists use a range of techniques to approach different musculoskeletal issues making this type of remedial massage suitable to exercise or sports enthusiasts, office workers and those struggling with acute or chronic pain. It is advised that you are seen for an Initial Assessment with a Physio prior to a massage allowing for clear diagnosis and a more directed massage treatment. Half hour sessions allow for thorough treatment of one problem area and a full hour should be considered for full body/ multiple areas requiring attention. Sports massage sessions may be purchased individually or in a block of three or six. This luxurious massage form is performed on a bed of warm water. Various soft tissue and mobilisation techniques are applied to the full body while you lie in supine throughout, bolstered and positioned for comfort. Water pressure assists the therapist in gaining deep tissue mobilisation with ease and results in a wonderful release of the soft tissues and joints of the entire body. Hydrotherm is appropriate and beneficial in pregnancy. It offers clients with musculoskeletal injuries, chronic pain or cancer a relaxing and safe medium of treatment and equally can be adapted to pre or post sport event needs.Hydrotherm massage sessions may be purchased individually or in a block of three or six.